America Revealed: U.S. Encouraged Gun Sales to Drug Cartels, 70% of Seized Mexico Guns Are from U.S.
in the United States and brought to Mexico." Some 70 percent of guns seized in Mexico from 2009 to 2010 came from the United States, according to a new report from three U.S. senators. The report finds Mexican drug cartels are arming themselves with U.S. military-style weapons and urges a strengthening of U.S. regulations to stem the flow of guns to Mexico. It comes as lawmakers are holding hearings into a once-secret government plan to encourage U.S. gun shops to sell thousands of guns to middlemen for Mexican drug cartels. The operation, called "Fast and Furious," focused on using middlemen to gain access to senior-level figures within Mexico’s criminal organizations. Run by the U.S. Bureau of Alcohol, Tobacco and Firearms, the operation has come under severe criticism since hundreds of the guns that were sold to the cartels were later found at crime scenes in both countries, including two at the murder scene of a U.S. Border Patrol agent. We speak to David Heath at the Center for Public Integrity. AMY GOODMAN: A new report from three U.S. senators finds some 70 percent of guns seized in Mexico last year came from the United States. The report is called "Halting U.S. Firearms Trafficking to Mexico" and was compiled by Democratic Senators Dianne Feinstein of California, Charles Schumer of New York, Sheldon Whitehouse of Rhode Island. It finds Mexican drug cartels are arming themselves with U.S. military-style weapons and urges a strengthening of U.S. regulations to stem the flow of guns to Mexico. Mexican President Felipe Calderón has repeatedly called for the U.S. to implement stricter firearms laws. Last year, he accused the Americans of, quote, "irresponsibility" on arms sales. PRESIDENT FELIPE CALDERÓN: [translated] The Americans began to sell arms as a voracious, ambitious industry, like the American arms industry. This often provokes conflicts in countries that are poor and less developed, such as Africa, due to the sale of arms, is in a very similar situation to that which is being lived by the Mexican people. For the arms traffickers, it’s a business to sell arms to criminals, and we need to mobilize not just public opinion against this, but unite with international public opinion to show the irresponsibility of the Americans, as much as it bothers them or hinders their political campaigns. AMY GOODMAN: That was Mexican President Felipe Calderón. Meanwhile, Congress is holding hearings this week on a once-secret U.S. government plan to encourage U.S. gun shops to sell thousands of guns to middlemen for Mexican drug cartels. The operation is called "Fast and Furious." It focuses on using these middlemen to gain access to senior-level figures within Mexico’s criminal organizations. Run by the U.S. Bureau of Alcohol, Tobacco and Firearms, the operation has come under severe criticism since hundreds of guns that were sold to the cartels have later been found at crime scenes in both countries, including two at the murder scene of a U.S. Border Patrol agent. For more, we’re going to Washington, D.C., to David Heath, senior reporter at the Center for Public Integrity, who’s extensively covered Operation Fast and Furious and gun trafficking on the U.S.-Mexico border. Welcome to Democracy Now!, David. Explain Operation Fast and Furious, which is going to be the focus of a hearing today in Washington. DAVID HEATH: Right. Beginning in late 2009, the ATF decided that they wanted to make a strategy shift in how they investigated gun running. Typically what the ATF does is they focus on what’s called straw buyers. These are people who are paid to go buy a gun for somebody who can’t legally go buy a gun. And typically, what they do is, once the straw buyers buy a gun, they try to confiscate them and take those weapons out. That strategy, according—the ATF felt that that stategy wasn’t working. Tens of thousands of weapons are making their way into Mexico. So they decided that what they wanted to do was look at the straw buyers and try to follow the guns up the chain of command and take out an entire gun-running organization. And their hope was that, by doing that, that they would be more effective in stemming the flow of weapons. This really goes against the culture of the agents at the ATF. It goes against their training. They saw weapons that were essentially being allowed to hit the streets and go out, and it upset them, and especially when two of the weapons were found at the murder scene of a Border Patrol agent who was killed. AMY GOODMAN: This was Brian Terry, right? Brian Terry, the U.S. Border Patrol agent in Arizona? DAVID HEATH: Right, Brian Terry, mm-hmm. Yes. AMY GOODMAN: Talk about the hearings and their significance. I mean, we’re talking about the possibility of holding the Obama administration, the Justice Department, in contempt. DAVID HEATH: Yeah, that’s a very unusual thing. I think it’s only happened a few times in history. What’s happening is that there’s two investigations going on right now. The inspector general in the Justice Department is investigating to see if mistakes were made in the approach that the ATF took. At the same time, members of Congress, specifically Senator Charles Grassley of Iowa and Darrell Issa of California, Representative Darrell Issa of California, are also doing their own investigations into Operation Fast and Furious. And I think they’re going to have a hearing today to—and they’ve already released a report to show, essentially, that agents within the Phoenix office of the ATF were very upset about how this was handled. AMY GOODMAN: Addressing a meeting of the National Rifle Association in April, former U.S. ambassador to the U.N. John Bolton argued American guns are not to blame for drug-related violence in Mexico. JOHN BOLTON: There are a lot of guns in Mexico in the hands of the drug cartels, absolutely. Where do they come from? No doubt, some of them come from the United States. A lot of things in the world come from the United States. 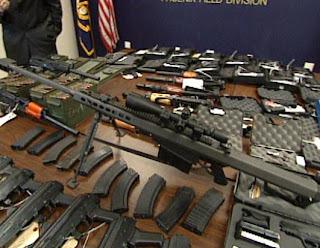 But the bulk of those guns in the hands of the drug cartels probably came from police arsenals in Mexico or arsenals of the Mexican army, where corrupt police officials and corrupt army officials sold them to the drug cartels’ agents. Or they were procured in the vast international weapons market that the cartels obviously have access to. The idea that what’s going on in Mexico is somehow our fault because of lax gun control laws here is exactly the kind of subterfuge that the Obama administration would like to carry forward in the near future to get stronger gun control laws here. AMY GOODMAN: That was former U.S. ambassador to the United Nations John Bolton. David Heath, his arguments, and especially in light of this report that 70 percent of the guns seized in Mexico last year were from the United States? DAVID HEATH: Right. The only data we have on this are the guns that are recovered by the Mexican authorities and then traced by ATF. That’s really the only data that exists on that. And the data is that in the last two years there were roughly 30,000 guns that Mexican authorities asked the ATF to trace. And often, these guns come with incomplete serial numbers, or they’re not inputted into the database correctly, so there’s a lot of times when they can’t do a match. But of those that they were able to trace, 70 percent of the weapons—about 20,000 weapons—were traced back to the United States. There’s 8,500 gun dealers along the border of Mexico. And you can, of course, buy assault weapons, and very easily, at any of these gun shops. AMY GOODMAN: I mean, very interestingly, CBS News did a big exposé on Operation Fast and Furious. It didn’t get a lot of attention. Sources told CBS News several gun shops wanted to stop the questionable sales, but the ATF, the U.S. government—you know, Alcohol, Tobacco and Firearms, the agency—encouraged them to continue. DAVID HEATH: Yeah, my understanding is that there was one gun shop that had raised questions, and there had been gun shops in the past that had been held liable for selling weapons. And so, there are issues about that. And so, there was one gun shop that I know of that raised questions about selling these weapons, and the ATF, as I understand it, told them that they were doing an investigation and that if they helped, that this would supposedly help them trace the guns to the cartel. AMY GOODMAN: And then the issue of the sunset of the assault weapons ban, which President Obama says he will not push to reinstate, the significance of the flow of assault weapons into Mexico? DAVID HEATH: Right. One of the things that hasn’t gotten very much attention in this whole investigation is that, up until 2004, AK-47s were illegal in this country. There was a ban for 10 years on assault-type weapons, these military-style weapons that the drug cartels like. And so, you’ve seen a dramatic increase in violence in Mexico since then. You’ve seen—and these AK-47s, especially, or these .50 caliber guns, are really the weapons of choice for the drug cartels. And just in the last—since 2007, you’ve seen about 34,000 drug-related deaths caused by firearms in Mexico, 15,000 just last year. So there’s been an explosion of violence in Mexico. And like your report said, President Calderón really blames that on the lifting of the assault weapons ban. AMY GOODMAN: It’s fascinating to see the conservative presidents of Mexico, from Vicente Fox to Calderón, also all pushing for some kind of decriminalization or legalization of drugs at this point, talking about sane drug and gun policies. DAVID HEATH: Right. I mean, I think the other—I mean, what you have is you have—these cartels are, as you know, are huge. I mean, these are multibillion-dollar organizations, and they’re really equipped like armies. They have helicopters. They have grenades. They have military-style weapons. And this is all being funded by America’s appetite for illegal drugs. They’re coming north through the border. And as you have these drugs coming north, you have—through that same pipeline, through the same people, you have guns going south. So they’re really tied, very closely tied together. If you could stop the flow of drugs, then you would also simultaneously be stopping the flow of guns. AMY GOODMAN: David Heath, I want to thank you very much for being with us, senior reporter at the Center for Public Integrity.